In most areas of life, competition is a good thing. It is what drives people, industry, business – and sport forward. It is what stops it getting too content, set in its ways, lazy. But it can go too far. Too much competition, too many people wanting a slice of the same pie will inevitably lead to some people missing out. And when there is a new kid in town, a potential bully who will demand an ever-increasing share, then some of the old guard may well be left with more than a bloody nose. So just how much of a threat is the NFL to rugby in the UK, and specifically here in Ulster? The state of play in Ulster has been one of more or less consistency for as long as many of us can remember, at least in terms of the number of sports vying for our attention. Rugby has had to compete with the likes of football (soccer), as well as hurling and Gaelic football, and in the main it has done well. Soccer is always going to win the popular vote, while hurling and Gaelic football in particular have seen a decrease in popularity in recent years. Rugby has fared well in that period, largely but not entirely due to the Celtic League. Attendances are healthy – steadily rising in several cases – and the fact that a handful of clubs have undergone or have announced increases in ground capacities is indicative of the feeling within the game. Away from the domestic scene, the might of the English Premier League is the biggest pull regarding audience figures (television wise as well as those who regularly make the flight over to Manchester or Liverpool every other weekend). So with any balanced system, the threat of a new party joining in the fray is one that could have consequences. The NFL is nothing new, it has had a small number of fans throughout the UK and Ireland for years. Recent developments however might herald a new offensive, one that could potentially change the sporting landscape here for good. Many people’s first real connection to the NFL, or American football in general, came with the advent of Channel 4 in 1982. For the first time, live games were shown and suddenly people in the playground were talking about the game, playing the game. 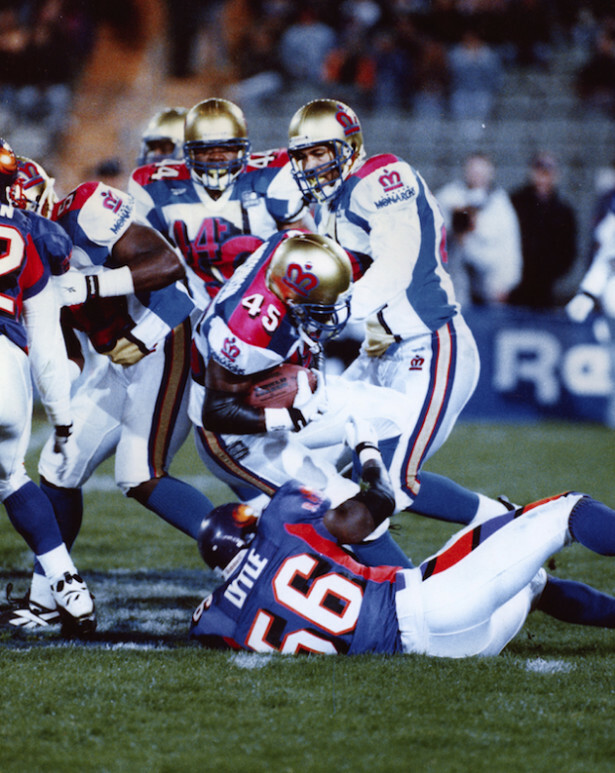 Popularity in it grew, and under a decade later the UK had its first franchise in the shape of the London Monarchs. Fast forward a few years and after a name change, a downsizing of their home ground (from Wembley Stadium to an athletics ground in Birmingham) the franchise was moved to Berlin. Since then there has been a small but constant support of the game, both playing and watching on TV. 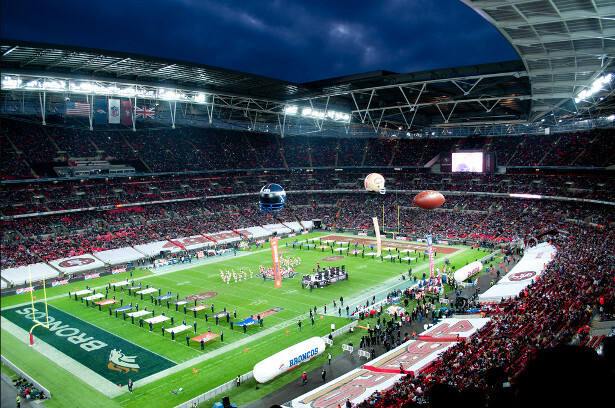 Since 1997, Wembley has seen an NFL game, this year there have been three games, with a total attendance of over a quarter of a million people. Next year it has been announced there will be four NFL games played in London – two at Wembley, and two at Tottenham Hotspurs’ new ground. There has been talk that a London Franchise could be put in place as early as 2022. This time that franchise would play in the actual NFL, not some cobbled together European league. Often a good indicator of a nation’s appetite for a sport is mirrored by its appetite to bet on it. The betting market for American sports, including the NFL is small – but growing. You don’t have to look hard for the odds or tips for all NFL games. When these shores has its own (sort of) team, that groundswell of support will grow. It is how much it will grow that is the million dollar question. In reality of course, it is a hell of a lot more than a million dollars at stake. The easing of betting restrictions in the United States could see the NFL receive more than $2 billion a year. Those in the game will not be blind to the global impact the EPL has made, and they will be trying to emulate that. The London venture could very well be the start of that. Club rugby, and more importantly school rugby, is where the sport is embedded into the lives and psyche of players and their families alike. It is that group of people who are most vulnerable to having their head turned by this new brash imposter. The threat of the NFL may seem a distant and weak one at the minute, but if there is one thing that America can do very well, it is put on a show, and polish, market and sell that show. Ignoring it would be a grave mistake.